Mark Blaxill and Ralph Eckardt have consulted for companies that are highly efficient, full of hard workers and smart managers—yet barely able to make out a profit. They’ve also worked in undisciplined, mismanaged companies that generate huge margins year after year. The key to sustainable profits, they realized, was intellectual property. Yet most managers are unable to see the power of IP because they were trained to focus on more tangible factors. This book is about turning invisible assets into an unbeatable edge. With the right IP and the right strategies, companies can command premium prices, increase market share, sustain lower costs, and even generate income directly. Without it, their products are undifferentiated and they can compete only on price. The authors teach readers a new way to see their invisible assets, analyze them, and build a business around them. Unlike other books that focus on the legal and technical issues of IP, this one is totally practical. 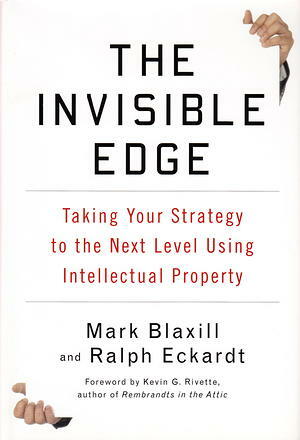 Blaxill and Eckardt include fascinating case studies, ranging from golf balls (did Titleist steal technology from Bridgestone?) to Facebook (can it sustain its lead against new social networks?). They also look at a dozen mainstream companies in a wide range of industries, such as Toyota, Procter & Gamble, and IBM.